Jacob Lawrence (1917–2000), General Toussaint L'Ouverture from the series The Life of Toussaint L'Ouverture. Screenprint, 1986. © Estate of Jacob Lawrence. ARS, NY and DACS, London 2017. This display features a selection of objects, artworks and poetry from the 18th century to the present. Together, they explore the legacy of the Haitian Revolution and its leader Toussaint Louverture. 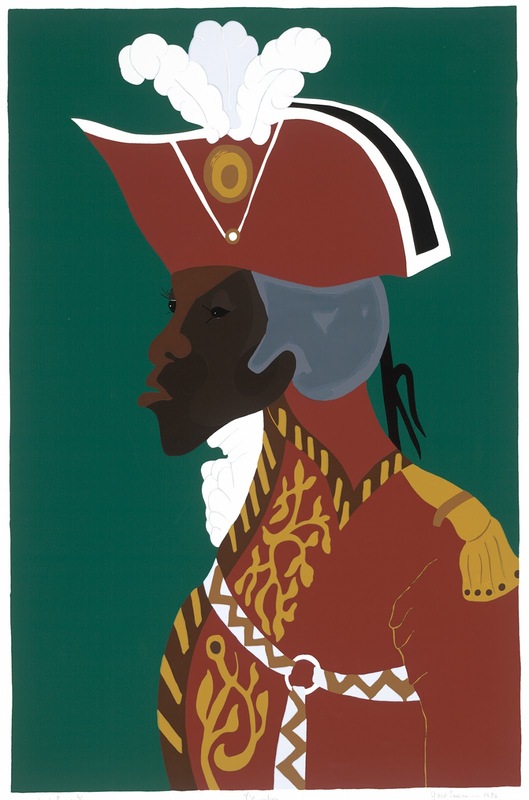 Louverture was one of the leading figures in the Haitian Revolution, which began in 1791 as an uprising of enslaved men and women in what was then the French sugar colony of Saint-Domingue. It culminated with the outlawing of slavery there and the establishment of the Republic of Haiti. The display features representations of Toussaint Louverture, including a work by African American artist Jacob Lawrence (1917–2000), showing Louverture as a powerful revolutionary general. For Lawrence and his contemporaries in 1930s America, the radical history of Haiti became an important reference point in debates about rights, race and ethnicity. The United States occupied Haiti from 1915 to 1934. During this period, Vodou – a religion practised by people in the African diaspora, and sometimes incorrectly referred to as ‘voodoo’ – was suppressed. Vodou had played an important role in the Revolution of 1791, uniting communities and helping enslaved people to organise themselves against injustice. Another key object in the show is a Haitian Vodou boula drum, seized by US Marines during the occupation, and on display in the Museum for the first time. Haitian-born artist and anthropologist Gina Athena Ulysse’s contemporary juxtaposition of Vodou chant with words of anti-imperial protest provides an audio accompaniment. The legacy of the Revolution is showcased through objects made at the time and centuries later – a banknote featuring female revolutionary Sanité Bélair, William Blake’s illuminated poetry celebrating slave revolution, a coin commemorating the abolition of slavery, and C L R James’s influential account of the Revolution, Black Jacobins, reissued during the US Civil Rights movement. Together, this wide variety of objects highlights the reach of the Haitian Revolution across both time and space, and this display reminds us that the struggles first begun in Haiti are still crucial in our world today.